The Staff Engagement network in the east of England, facilitated by Civil Service Local, has devised and delivered an innovative workshop on Effective Staff Engagement. A cross-departmental group of representatives drawn from the network were keen to share their knowledge and experience on engagement more widely across the civil service in the East of England. At the same time, in consultation with HM Passport Office, we identified a need to provide practical support to a group of relatively inexperienced engagement champions within the Peterborough Passport Office. So as part of Home Office Learning at Work Week, we agreed that our cross-departmental team would design and deliver a presentation aimed at giving them the confidence, knowledge and resources to fulfil their roles more effectively. Rob Neil (Ministry of Justice), Zarah Hornett (Legal Aid Agency), Trevor McKinnnon (Ministry of Defence), John Drake (HM Passport Office), Bryn Probert (HMRC) and Lindsey Duckett (Cefas) met to discuss the content and structure of a workshop tailored to meet the needs of the Passport Office. On 7 November, Rob and Zarah delivered a two-hour learning session, showcasing the importance and value of an engaged workforce, providing real-life examples drawn from a variety of departments and also providing the attendees with an Engagement resource pack to utilise in the future as required. 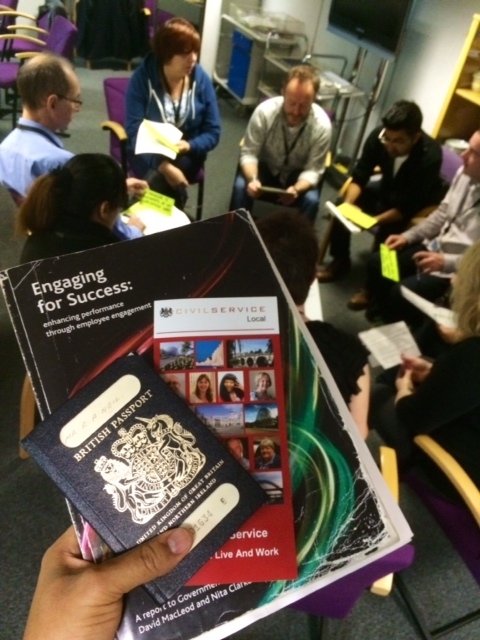 Staff at HM Passport Office Peterborough discuss the importance of an engaged workforce. Feedback has been very positive, with all delegates agreeing that the workshop met its purpose of providing both theoretical and practical support on engagement. The model for the workshop, and the accompanying resource pack, is now available to be rolled out at other locations around the region – a real-life example of what can happen when the civil servants share their expertise in a collaborative fashion, exemplifying the aspirations of the Civil Service Reform Plan. If you'd like to see a similar session on engagement in your workplace, please get in touch with Bryn.